Why go to a dealer? The bathroom is becoming increasingly defined as a living space and place of relaxation. A greater sense of “feel-good” is achieved by means of a homely ambience and a design where the bathroom opens onto the bedroom. This means that there is now more living space in the bathroom, and two cosy rooms are merged in a practical way. The room is separated into a cosy relaxation area and a purely functional area for shower and toilet. For example, the toilet becomes an area in the space between bedroom and feel-good area. 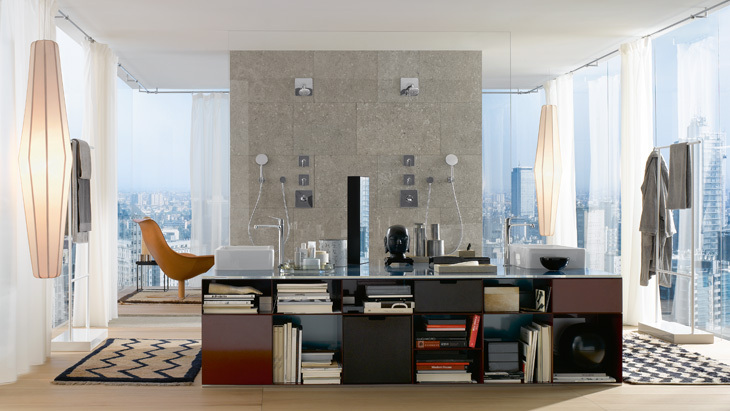 Large windows, which let in the natural light, and home accessories ensure that the bathroom has a comfortable ambience. Natural wooden flooring and precious materials such as black and white marble underline the elegant character of the room. The architect and designer Antonio Citterio defines the bathroom as a source of relaxation. For him, therefore, it is natural to separate the feel-good and functional areas from one another. He created this room concept specifically for Axor Citterio.